Heavy overnight rains that extended into daytime Saturday have forced the cancelation of the Saturday, June 4 program at Macon IL Speedway. It is just the second rainout in the first nine tries this season at the 1/5-mile high banked dirt oval. Speedway officials were scheduled to hold the BG Nevitt Memorial Faster Pastor race in addition to having $1 hot dogs in the speedway concessions and a hot dog eating contest at intermission. Racing divisions on the card included the UMP Pro Late Models, Billingsley Towing UMP Modifieds, Midwest Big Ten Street Stocks, B-Mods, Hornets, and the Beach House Micros. 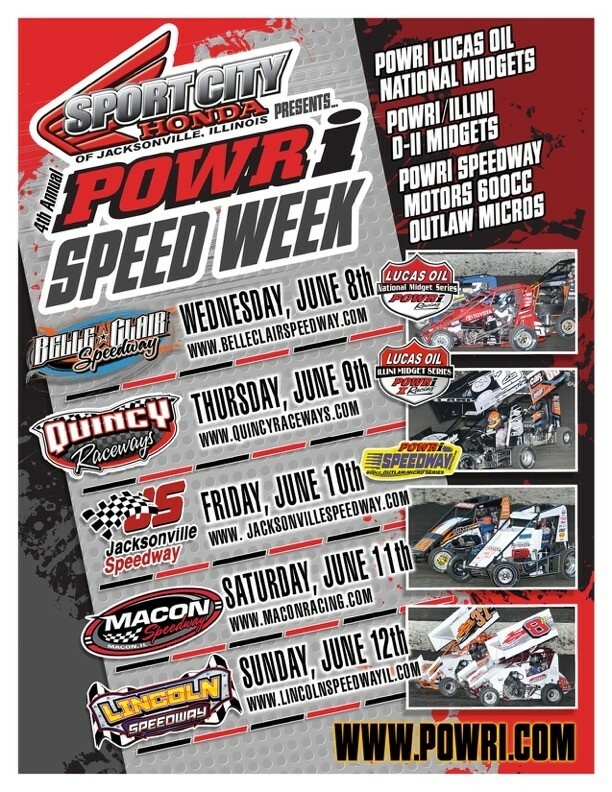 Up next on the schedule is the POWRi Illinois Midget SPEED Week coming up next Saturday night, June 11. In addition to a huge field of POWRi Lucas Oil National Midgets will be the POWRi Speedway Motors Micros, POWRi/Illini D-II Midgets, and the UMP Pro Late Models. The June 11 event is the fourth out of five for the series traveling across Illinois this upcoming week. It all begins at Belle-Clair Speedway on Wednesday, June 8, followed by Quincy on June 9 and Jacksonville on Friday, June 10. Mighty Macon Speedway will be on Saturday night followed by the finale at Lincoln Speedway on Sunday, June 12. Macon pit gates will open at 3:00, grandstands at 4:00, local pill draw ends at 5:50, hotlaps begin at 6:00, and racing will take the green at 7:00. Grandstand admission is $15 for adults and free for kids 11 and under.